Wealthy business owner, Gina Messina, aches for a place to belong. Leader of Gumboli village, Dr. Kam Bonsu, hungers for peace in his heart. Gina's nephew, eight year old Justin, wants to stay in Gumboli with his beloved lion, Maucho, and best friend, Kizza. Gina's brother Marco, whose death brings the three together has left a legacy for Gina to consider. But they all have one thing in common: the untamed spirit of Africa embeds itself within their hearts, daring them to grasp all that Africa has to offer and change what couldn't be changed. African Hearts is a stunning debut novel of faith and love. Let it inspire you to ponder what you might change in the time you have on this earth. Customer Reviews For "African Hearts"
African Heart is an inspiring story about what can be achieved when a person is prepared to give their all and sacrifice for their mission. I loved the characters in this book and found the issues Laura deals with are really challenging. Also a great insight into the African culture. I believe it will touch the heart of any reader. There were many aspects to African Hearts that captured my imagination. Laura O'Connell puts me so firmly in the picture it's as though I could reach out and touch the African landscape. But not only am I in touch with this location, by the end I know these characters so well it hurts to say goodbye to them. African Hearts is one you won't want to put down. 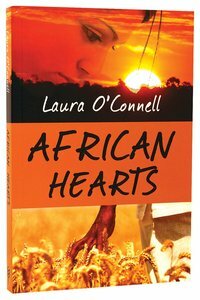 AFRICAN HEARTS  by debut author Laura O’Connell is about cross-cultural and inter-racial relationship and marriage. Leaving her business in Australia, Gina travels to Africa to answer the summons of Dr. Kam Bonsu. Gina received Kam’s letter too late to see her brother alive. Reaching the African village where her brother used to live, Gina is shocked to hear her brother has died and left his son to her care. Gina can’t take her nephew in her care. She can never take another child in her care. Not after a child in her care had died! And her nephew Justin didn’t want to come to Australia. He loved it there in Africa. What can Gina do? She can’t leave her only living relative there. There’s attraction simmering between Kam and Gina, what will happen? They’re of such different cultures! Can they do anything about this attraction? Will Gina’s faith in God’s wisdom show her the way? AFRICAN HEARTS is a romance that touches the heart with its poignant tale of fresh starts, past wounds and second chances. The inter-racial relationship between Gina and Kam is handled with care and understanding. Laura O’Connell is an author who understands that the best fiction is that which not only gives us great pleasure through deep characters and beautiful prose but challenges us and leaves us emotionally richer and stronger long after we close the book. Gina Messina jumps on a plane to leave Australia after she hears news that her brother in Africa is critically ill. She meets Dr Kam Bonsu and they have an instant attraction. Their hearts are both bound by past love and loss and neither can see how they can have a worthwhile relationship spanning the continents. Then add Gina’s eight year old nephew into the mix and a whole lot of romance … and … you have African Hearts. Laura takes the reader on a journey of love, loss, responsibility, grief, hope and peace. The reader has a chance to think about their own religious beliefs and the condition of their heart. The majority of this story is set in Africa and Laura has described the country in beautiful prose. I was reminded of my desire to travel to Africa one day and see all of the animals in their natural habitat. After being on three short term ministry teams to Africa, I eagerly bought this book - although I have to confess with some hesitancy as there are so many sad stories from Africa. And this novel certainly does have content that caused me to stop, to think, but above all to pray for the Christians who are especially doing it tough in too many places there. This story is so well written by Laura O'Connell, an enthralling read and one NOT to miss. She captures very well not only the images I still have of some of the places I visited but also the courage, the hope, that love the Africans share so well!